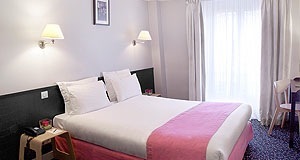 The Hotel Acadia Opéra is a 3 star hotel, near the Great Boulevards, the Opéra Garnier, the Galeries Lafayette and the Printemps department store. It is located 50 m away from public transport and provided with a comprehensive service, modern decoration and comfortable bedrooms. Additionally, a satellite TV, a free wifi connection, and a safe deposit box in each bedroom are available for clients.